If you like cheesecake but don’t want all the extra calories and sugar, make these Lemon Cheesecake Bars! 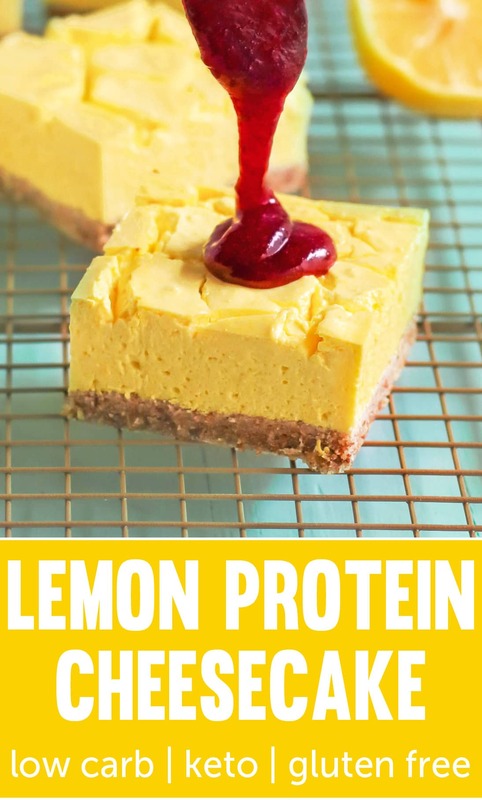 These Lemon Cheesecake Bars taste like the real thing, but they’re secretly good for you! You’d never guess that they’re sugar free, low carb, high protein, gluten free, AND keto-friendly too. Every bite is like a wave of freshness throughout your entire body. This thick and creamy cheesecake is super super tasty, uber fresh, and totally lemony! You really would never be able to guess that it’s good for you. I mean, it’s too sweet and flavorful to be nutritious… and it’s definitely too rich and creamy to be diet-friendly… right? The ingredient list of this cheesecake is much healthier than any store-bought or bakery-bought kind. And that’s the thing I love about healthy food — it can taste great! If you like cheesecake but don't want all the extra fat, calories, and sugar, make these Lemon Cheesecake Bars! It tastes like the original, but it's secretly sugar free, low carb, high protein, gluten free, and keto-friendly too! Preheat your oven to 350 degrees Fahrenheit and spray an 8x8" brownie pan with cooking spray. In a large bowl, whisk together the almond flour, cinnamon, and salt. Add in the melted butter/coconut oil and egg white, and stir until completely combined. Dump the mixture into the brownie pan and pat it out. Bake for 12 minutes. Let cool while you make the filling. In a stand mixer bowl fitted with a whisk attachment, add the cream cheese and yogurt. Whip on medium speed until smooth and fluffy. Scrape down the sides of the bowl and whip again. Turn the mixer on low and add in the eggs, egg yolk, lemon zest, and stevia extract. Increase the speed to medium-high and mix until completely smooth. Turn the mixer on low and add the starch and turmeric. Increase the speed to high and mix until completely smooth. Scrape down the sides of the bowl and whip again. Pour the mixture over the crust and bake for ~44 minutes, or until the center barely jiggles. The surface of the cheesecake will crack, but that's okay. You can cover it with whipped cream, Lemon Curd, or Blueberry Compote! Let cool completely, then cover and refrigerate overnight. Slice, serve, and enjoy! You can certainly use a graham cracker crust instead of almond flour crust if you like. To do that, simply make these Gluten-Free Graham Crackers, grind them until flour-like, measure 2 cups of the graham cracker crumbs, and stir it with ¼ cup of melted coconut oil. I’m pretty shocked — in a good way — about the nutrition facts for this recipe! For a big serving (1/9th of the entire pan, to be exact), there are only 270 calories and 0g of added sugar (the sugar content is naturally occurring in the yogurt and cream cheese), plus a whopping 18g of protein! If you want to compare these numbers to “regular” cheesecake, you’ll be even more shocked. A slice of “regular” cheesecake will have at least 400 calories, 25g of fat, and 27g of sugar. 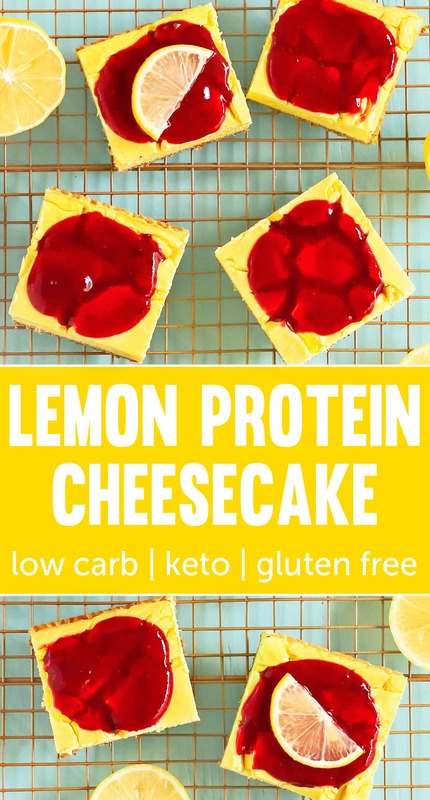 And if you want to take it even further, let’s stack my recipe side-by-side with the Cheesecake Factory’s Lemon Cheesecake, where a single slice has 1,170 calories, 73g of fat, and 95g of sugar. Yes, seriously!!! I vote my cheesecake. I vote mine all the way. I like the idea of making this in a square pan. It serves up so much nicer. Your presentation here is so enticing. Lovely blend of flavors, I am sure this one did not last long. Great post! These cheesecake bars look so great! I have never made cheesecake at home because I’m afraid I’ll eat the whole thing (!!! ), but your recipe looks perfect for a special occasion. 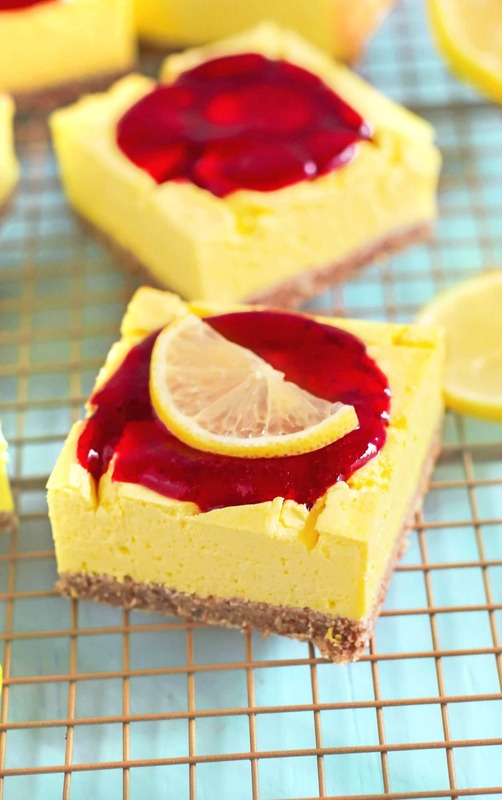 Lemon Cheesecake Bars its looks is great! This Lemon Cheesecake i was never making a home because of that’s trips is heart for me but i can get from the market. These are super healthy and they look amazing! hey jessica! this looks so amazing i would love to try it and i need to so so so so badly! but one question: can i replace the protein powder in the filling with anything at all? I’m making these for my fiancé’s birthday. What size brownie pan? Hi Jesse. Sorry to bug. Can you please see my other comments! Trying to make this tmrw bit couldn’t find stevia extract anywhere! Hi Jesse. Sorry to bug. Can you please see my other comments! Trying to make this tmrw bit couldn’t find stevia extract anywhere! Any tips? I’m not sure how to replace the stevia extract here. 1 tsp sweetens like 1 cup of sugar. In your previous comment you said you don’t have stevia extract but you have stevia… did you mean like Stevia in the Raw? If you have that, you can probably use ~1 cup. I didn’t calculate the calories here so I’m not sure what each slice equals out to. Hi Jess. Thanks for your reply! Yes I have stevia powdered sweetner So I should use a cup of that? What brand of stevia is it? I only have experience with Stevia in the Raw so I don’t want to give you any wrong advice. Does the package have a conversion chart on it that recommends how much to use in order to replace sugar? Hi Jess. I made this today and it was amazing. Can’t believe it has protein powder in it! Is there a way to make it a no bake cheesecake by chilling for a period of time or does it have to be baked? Hi. I love your recipes! If I don’t hsve stevia extract can I just use stevia and if so how much? Also do you have the calories and macros for this recipe? I love that it uses protein powder I’ve been trying to find a cheesecake recipe thst does. How many cups do the 2 scoops equal to? I think I will try with graham cracker crust as almonds are so expensive where I live. But I do love the idea! Why the corn starch?i don’t think the corn starch is Keto. What can I use in place of the corn starch? Love your recipes and this cheesecake looks delicious. thank you so much. It’s only 3 tbs of starch that would need to be subbed, so it’s not too much. You can also try protein powder or collagen! I’m definitely going to make this Jess! You are so awesome! Do you sell a recipe book that is totally no added sugar? 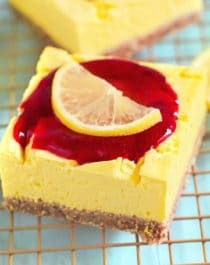 Lemon is a great cheesecake flavor because both the plain cheesecake flavor and lemon flavor are somewhat tarty and sour. Nothing fits better than that! A fruity jam is the perfect sweet balance to top a slice off. What an amazing treat!